The Takagi-T-H3S-DV-P Liquid Propane Condensing tankless water heater is a top performance, fully condensing Ultra-Low NOx gas tankless water heater from Takagi. This 180,000 BTU heater is designed for commercial or residential applications and can deliver hot water up to 140 degrees F with a 8 GPM flow rate. 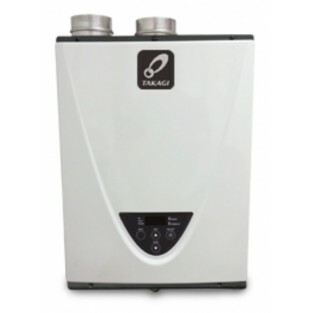 The included wired remote thermostat controller TM-RE40 will allow the heater to reach temperatures up to 140 degrees F.
This Takagi gas tankless water heater is Energy Star rated and can produce enough hot water for 2 major applications in most homes. Unlike traditional non-condensing models, condensing technology captures heat from the exhaust gas and uses it to preheat the incoming cold water. This increases efficiency and reduces emissions -- Complies with Ultra-Low NOx regulations of less than 14 ng/J (<20ppm). This heater features an electronic ignition system and can vent through either 3 inch or 4 inch diameter PVC/stainless steel vent pipe either through the side wall or up through the roof. A PVC concentric venting option is available. This heater comes with built-in freeze,overheat and surge protection. The T-H3S-DP-P requires a minimum of a 3/4" gas line. The T-H3S-DV-P can be used with storage tanks, recirculation systems, hydronic heating systems, radiant floor systems, and/or domestic & heating applications. Glycol mix can be run through the heater but please see installation manual for proper products to use and mixing percentages. For all outdoor installations please see the Takagi-T-H3S-OS-P outdoor unit. Please be aware the outdoor units are designed for warmer southern climates that normally do not freeze.